30.03.2016. 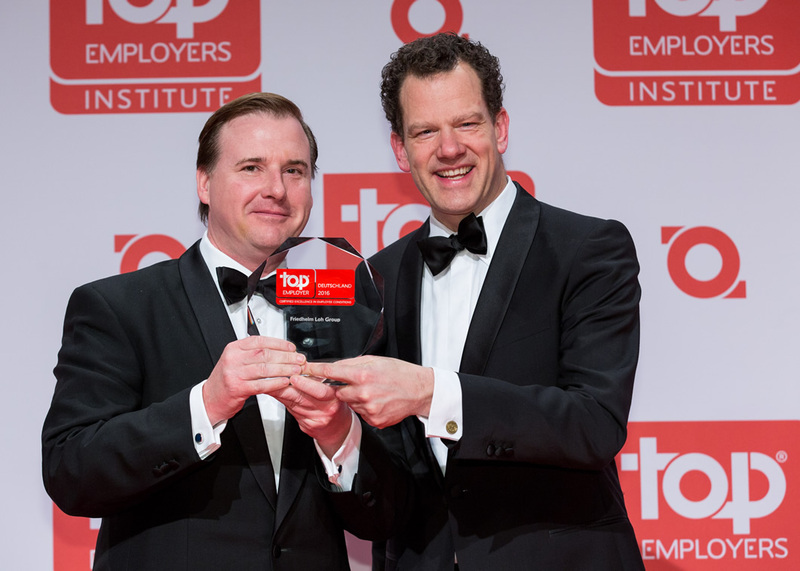 This tops it all: For the eighth time in a row, the Top Employers Institute has voted the Friedhelm Loh Group one of the best employers in Germany. The family-owned company excels by promoting young talent at an early stage, by having passionate managers and a value-oriented corporate culture. That is why the Friedhelm Loh Group has again received a "Top German Employer" award in 2016. 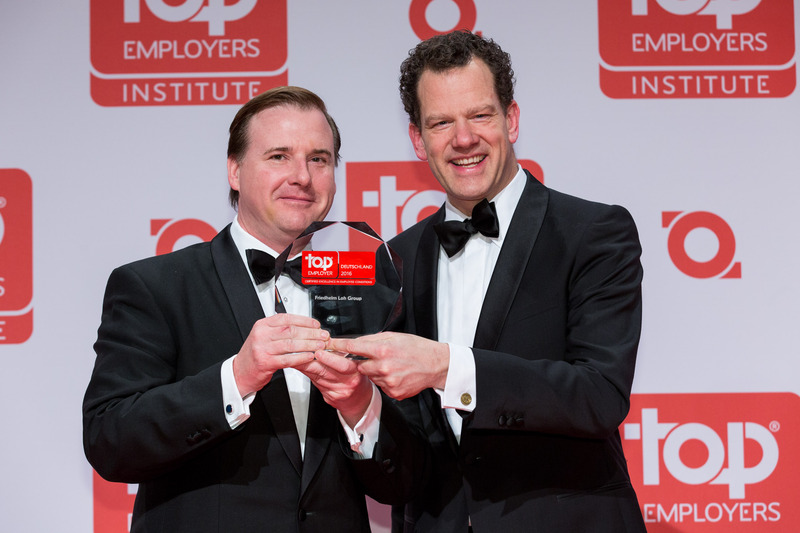 Every year, the Top Employers Institute honours worldwide leading employers that exhibit outstanding personnel management and strategy. Only companies that have been subjected to a strict investigation process may call themselves a “Top German Employer”. The companies have to meet high requirements in a variety of categories. In an onsite audit, they also have to show that they deserve the top notes worthy of a top employer. The Group’s field of training and development received special praise. The inhouse training institution, the Loh Academy, has so far held over 25,000 seminars and workshops, including the “Managing with Passion” programme, which last several months. The Academy’s innovations such as the “Chances Center”, which encourages staff to discovery their own strengths and talents, were also well received. “Success doesn’t just happen. The employees are a very special success factor for the future direction of our group. We are investing so that they can continually develop,” explained Marcus von Pock. This also applies for the next generation. The Loh Academy is supervising around 70 students in the “StudiumPlus” programme. They are young people who work in the Friedhelm Loh Group when they are not attending lectures, and who bring valuable expertise from their universities directly into their project work. At the same time as completing their international degrees, the students are gaining practical work experience in projects within Germany and elsewhere. The more than 200 trainees in the Friedhelm Loh Group are already being given early and responsible tasks to perform. In the “off-the-job” workshop, they learn, far from the workplace, how to develop their own projects through teamwork, and how to present and implement them. They are even running their own small firms within the company. With “Big Little Rittal “and “Ri2Youth” they are in charge of the vehicle pool and the procurement and administration of office supplies within the Group, or they process small technical orders from customers – with enthusiasm and a clear aim: To make their customers enthusiastic about their common achievements. The Institute also praised the social commitment of the Group as being remarkable. For example, staff make regular donations to regional charitable institutions every year and spontaneously, to international aid agencies. The Rittal Foundation is also engaged in local projects at the Group’s locations, for example helping disadvantaged children and young people, people with handicaps or families with an immigration background. Then the largest employer in the region takes its responsibility for the area where its employees live and work seriously. Marcus von Pock is aware that the goal over the next few years is to prepare employees for the special challenges of digitalisation and Industry 4.0, and he also takes a look to the future: “That’s why we are striving to make further improvements, particularly in the area of staff development.” Then with the award as “Top German Employer”, the Group shows that it is not only developing innovations for industry, but also for the workforce. Success does not simply happen. Instead, it only comes about as the result of a strong Group. Image 1: David Plink, CEO of the Top Employers Institute, presents Marcus von Pock (left), Senior Vice President Human Resources of the Friedhelm Loh Group, the 2016 award for Top Employer. Image 2: Special praise was given to the Friedhelm Loh Group’s field of training and development, as well as to youth development. Trainees and students assume responsibility at an early stage at the global player.